Any registered voter may vote using a vote-by-mail ballot instead of going to the polls on Election Day. A voter may request a vote-by-mail ballot for a single election or permanent vote-by-mail voter (formerly referred to as absentee ballot). You may use the application printed on the voter information guide that is mailed to you by the Registrar of Voters Office or you can complete on-line, print and mail to the Registrar of Voters Office, at https://elections.cdn.sos.ca.gov/vote-by-mail/pdf/vote-by-mail-application.pdf. Once your application is processed, your ballot will be mailed to you by the Registrar of Voters Office. After you have voted on your ballot review the information, make sure it is properly marked, insert your ballot in the envelope provided, and sign and complete the information required on the envelope. •	Vote-by-mail ballots that are mailed must be postmarked on or before Election Day and received by your county elections office no later than 3 days after Election Day. •	If you are not sure your vote-by-mail ballot will arrive in time if mailed, bring it to any polling place in your county between 7:00 a.m. and 8:00 p.m. on Election Day. •	Vote-by-mail ballots that are personally delivered must be delivered no later than the close of polls at 8:00 p.m. on Election Day. •	Vote-by-mail ballots that are personally delivered to a ballot drop-off location must be delivered no later than the close of polls at 8:00 p.m. on Election Day. 4. Authorizing someone to return the ballot on your behalf. •	Anyone may return your ballot for you, as long as they do not get paid on a per ballot basis. In order for your ballot to be counted, you must fill out the authorization section found on the outside of your ballot envelope. California Elections Code section 3017(c) requires county elections officials to establish procedures to track and confirm the receipt of voted vote-by-mail ballots and to make this information available by means of an online access system using the county's elections division web site at www.ocvote.com. •	Permanent vote-by-mail voters do not need to request a ballot; one will automatically be mailed to those voters for future elections. •	A one-time request for a vote-by-mail ballot is election specific. This type of application is only valid for one election. It is important to note that the voted ballot must be received no later than three days after Election Day, but it must be signed and dated no later than Election Day to be counted. As a military or overseas voter, in order to receive your election materials and vote when you are absent from your county while serving and/or living overseas, you need to apply for a vote-by-mail ballot by completing the online voter registration application or by completing the Federal Post Card Application (FPCA). The FPCA is available from the Federal Voting Assistance Program. Before you may request a vote-by-mail ballot, you must be a registered voter. 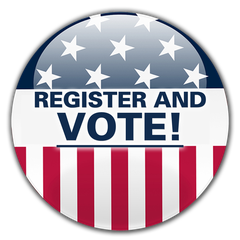 If you believe you are already registered, you can verify your registration online at www.OCVote.com . If you are not already registered, you can register online at www.RegisterToVote.ca.gov. As part of registering to vote, you are given the option to become a “permanent vote-by-mail voter,” which means you would automatically receive a ballot in the mail before each election.